After the disappointment that was One of Us is Lying last week, I decided that there was only one thing I could do to revive my faith in teen narratives. I sat down and watched The Breakfast Club. This John Hughes classic has been one of my favourite films forever but it’s been a while since I last watched it. It’s weird to watch it again in 2017 and realise that these five “kids” would still be considered fashionable if they walked into any modern high school. Ally Sheedy and Judd Nelson look exactly like the kind of hipster millennials that you can’t avoid these days. Turns out the 80s vibe really isn’t going anywhere any time soon. Although, I can’t really criticise them. 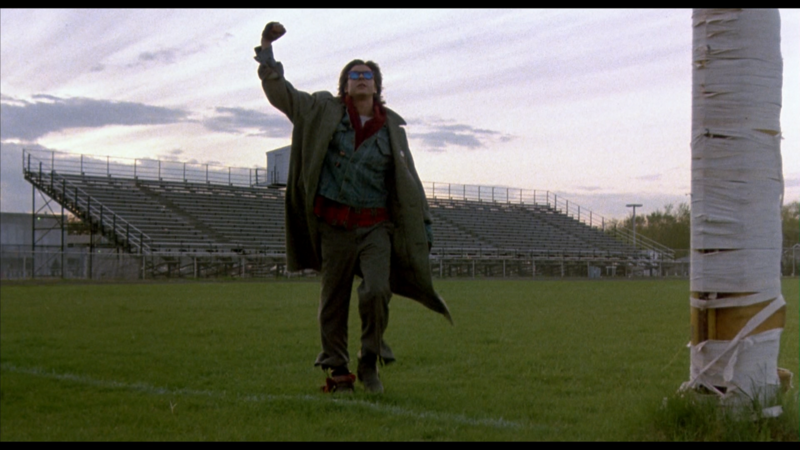 When rewatching this film I was struck by two things: number 1, Judd Nelson’s face is beautiful and, number 2, I would happily wear everything he was. The man’s got style. And, to be honest, I’d happily be Ally Sheedy too… well pre-makeover Ally Sheedy anyway. When I was younger I was obsessed with Molly Ringwald but, as I grew up, I realised I’m less Molly Ringwald and more Ally Sheedy. Which is fine with me. Well, as long as I can make different food choices. The premise of The Breakfast Club is a simple one: five students sit through detention on a Saturday. These five are all wildly different and intend to remain so. There is the jock (Emilio Estevez), the Prom Queen (Molly Ringwald), the geek (Anthony Michael Hall), the freak (Ally Sheedy) and the criminal (Judd Nelson). They spend their time arguing, laughing, and, ultimately, learning about themselves. It may be light on real action but it’s super heavy on character and development. Being a John Hughes movie, it actually feels as though you’re watching teenagers despite the fact that they all look like 20-somethings. He has a way of capturing the teenage voice and culture in way that feels natural. It’s something that not many other filmmakers have ever managed to achieve. A lot of teen movies and novels these days rely too heavily on stuffing their stories with slang to seem realistic but it only ends up making dated almost instantaneously. Hughes’ films have a universal and timeless appeal that means watching them in 2017 will appeal to teenagers in much the same way that it did in 1985. That’s not to say that The Breakfast Club is the perfect film. The script was written by Hughes in about 2 weeks and, if we’re honest, it kind of shows. It’s an often clumsy mess that flies all over the place and overuses stereotypes that have plagued teen movies since the beginning of teen movies. Each of the members of detention are the archetypal teens who have all of the cliched problems you’d expect them too. Then there’s the fact that the adult figures are so underdeveloped. The two, a vicious teacher and a laboured janitor, that show up in person are forgettable and one-dimensional. The moment where they bond in the basement is unnecessary and feels super out of place. It’s best just to let it go by without a second thought. Watching it with as objective an eye as I can possibly muster, The Breakfast Club is particularly dicey. It’s often unintentionally funny, overindulgent, confused with tone and pacing, and, generally, just confused. There can be no denying that Hughes has made better, funnier, and more emotional films than this. However, this is the one that has become the icon. It made Simple Minds a much bigger deal than they really deserved and has meant that, one day, I want to walk slowly across a football field with my fist in the air. Despite all of the potential flaws this film may have, it has a universal appeal and charm. The intimate setting means you really get to grips with the characters and the relationships. This is the kind of film that will appeal to anyone who has ever gone through puberty and it will continually appeal to them. Yes, it’s a bit par for the course but every time I watch this I get the same familiar feeling. It’s hard not to fall in love with this film. So, I accept the fact that this film isn’t the greatest you’ll ever see. But I think you’re crazy to just dismiss it out of hand. You see it as you want to see it – in the simplest terms, in the most convenient definitions. But what you need to find out is that this film is perfect. Does than answer your question?